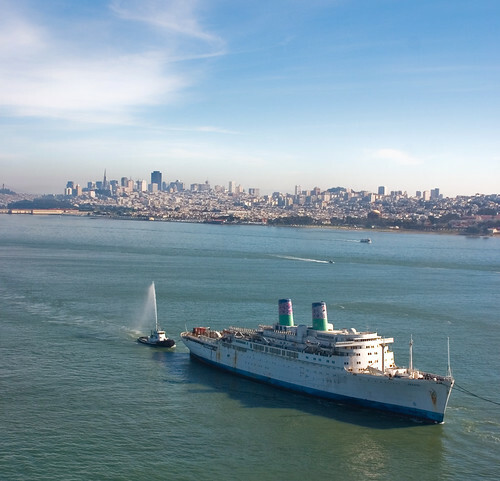 Our last view of the SS Independence — taken from the Golden Gate Bridge, being towed like a broken soul, on its way to be broken down on the beaches of Alang, India. As an aside: I contacted three different news organizations a full week before the ship was to be leaving. Not a single one covered the story. The San Francisco Chronicle eventually covered the story today. Others interested in the SS Indy across the country contacted news organizations, but as of today only the Chronicle has written a brief summary of its departure. With its socially/environmentally destructive “recycling”, historical drama, and suspicious-to-say-the-least corporate background, it could have easily been a Pulitzer-prize-winning feature. Unfortunately, our nation’s news media seems to be too beholden to killer bee and terrorist alert stories these days. Either that, or they have a vested interest in the public’s perception of Norwegian Cruise Lines. Readers: You decide. This entry was posted on Saturday, February 9th, 2008 at 2:55 am	and is filed under Built Environment, Demolished, Geography in the Media, Geotagged, History, Must See Geography, Off the Charts CrAzY!. You can follow any responses to this entry through the RSS 2.0 feed. You can skip to the end and leave a response. Pinging is currently not allowed. word up. im soooo glad you got a shot of this. i was wondering what it would look like as she left. I have seen a disturbing trend towards giving up all hope now that Independence has left Frisco. In the immortal words of USS Conolly museum member…”Dammit, DON’T GIVE UP THE SHIP!” There is still a chance she may be stopped in Guam as Pacific Hickory refused to stop in Hawaii….she has to refuel somewhere. When she is stopped in Guam, she will be brought in and tested for PCBs and Asbestos (don’t ask me how you test for Asbestos) by the EPA. Both will be found and she will be brought back to the US for cleaning…which NCL will refuse to do since she was “sold” and the transaction was “confidential” which of course will result in an awful mess. That, at least is the ideal situation. Been involved in several discussions on IRC and apparently the guy that owns runs Global Marketing is an Indian national and former business professor at some school in MD I believe. How you go from teaching business to getting involved in shady business dealings that involve export of contaminated materials to third world countries and running from the EPA, I’m not sure. Pretty shady, Eric. I appreciate the update. Thank you. The cat and mouse game continues. And, although GMS (Anil Sharma) has been fined over $500,000 U.S. Dollars by the E.P.A., this does not mean he will not face criminal charges for the illegal export of the Indy. How people like Anil Sharma, as well as the Indian ship scrappers at Alang are allowed to continue engaging in extremely illegal behavior is beyond me. What I do know is that there are individuals and organizations who will not stop their efforts in fighting criminals such as these. Independence breaking up due to neglect and environment while still in the water.